Recently I watched Band of Brothers. One episode centered on new men entering Easy Company as replacements after D Day. The men are welcomed with less than enthusiasm and are not sure what to make of it. And I thought as a combat air vet, that is just like I experienced when I joined the 13th TFS shortly after Linebacker II. I came to my new unit qualified to fly the backseat, but that didn’t me make accepted at first. The men who joined Easy Company had to prove themselves. We who came to fighter units did also. Qualified but not accepted summed it up. Shortly after my arrival we had a squadron party to bid goodbye to the men leaving and welcome us. This “Sawadee” – hello or goodbye in Thai – party was a unit tradition. The squadron commander got up and said, “Let’s welcome the New Guys (AKA F’ing New Guys).” And the crowd roared “Hello A..holes.” Then he said, “Let’s welcome the A..holes;” they responded “Hello New guys.” Then everybody laughed including us FNGs. We laughed but at the time I didn’t fully understand what had happened. As I think about it there really was more to this than hazing the new guys. Many of the New Guys were very cocky. In combat this meant nothing. Cocky could get you killed. We had come to the F4 with about 180 hours in training flights, this made us proficient but not adept at what we were doing. New Guys were always crewed with more experienced men. It was a process of learning from them and growing in our abilities. We were new guys but we weren’t yet trusted. We had to prove ourselves to be accepted into this very tight brotherhood. I found this to be the case not only in a combat unit, but just about every flying unit I flew with. 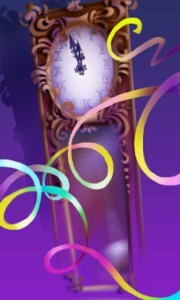 As time moved along, we earned our place. Some of the jocks went on the become very well respected. Some not so much. As a backseater there were several pilots that I didn’t like to fly with. They took chances and did some things I considered fool hardy. Disregarding altitude restrictions on a bombing run, overtaking lead too fast on rejoins, and not being able to refuel, and falling off or overtaking the tanker. Those were the scary ones. Sitting two feet behind an AC that couldn’t refuel was not a good thing. One of the worst pud-knockers I ever encountered was screwing around and decided to do a barrel roll around a tanker. 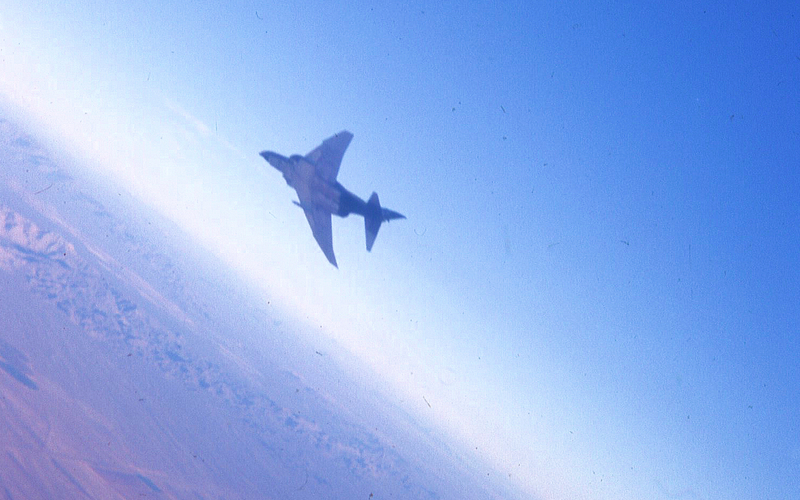 In the process he hit the tanker and took the top off the tail of the F4. He was lucky that it didn’t end in an explosion — a very bad outcome. And for me the result of this was — I became the recorder at his Flying Evaluation Board. He lost his wings and resigned his commission. There were prime pilots, and I flew with many of them — he was not one of them. And that in the end this is what it was all about: Trust. When you put your life in the hands of another no matter whether it was in the air or on the ground, you had to be sure you could trust that person. Happy New Year, did you ever wonder what it was like to be in Times Square at midnight, I went once nearly 50 years ago. In 1969 two of my friends and I went to welcome in the future in Times Square. This is something that everybody has seen on TV year after year, but few have experienced. In those more innocent times there were no metal detectors, no bomb sniffing dogs, and for the most part no restrictions on anything. It was a WILD AND CRAZY TIME. It was the 1960s, but more on that. This was originally posted in 2015, but as many American men and women remain in war zones, I offer it again as I do each year at this time. Christmas is such a family time, its easy to forget that there are folks who will not experience it with loved ones. For me that occurred during the Vietnam War. My wife and I had not even been married a year, when I went off to combat. The small tree my wife mailed to me so long ago. It was hard for her and it was even harder for me. The family sent me a care package and my wife mailed me a box with a Christmas tree in it. 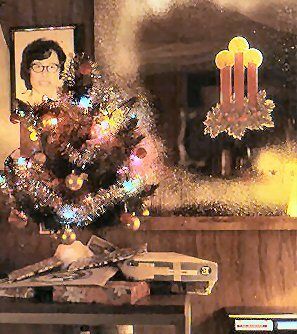 The photo of the tree at left ties me to that day so long ago, but I have very few memories of Christmas. Note the fake snow sprayed around the mirror – why the PX had fake snow for sale is beyond me. Behind the tree is a photo of my wife that –and the fake snow — tied me to home. 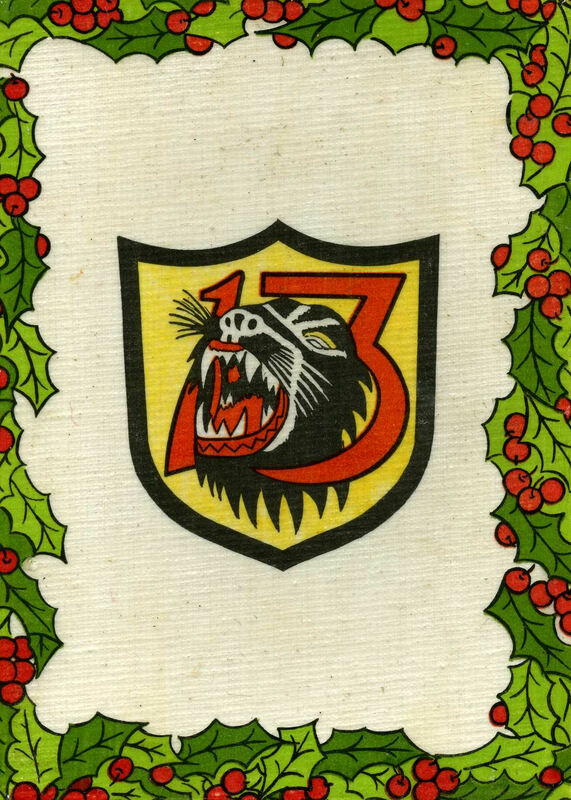 The only other reminder of that Christmas is the Squadron Christmas Card, below, which I kept. 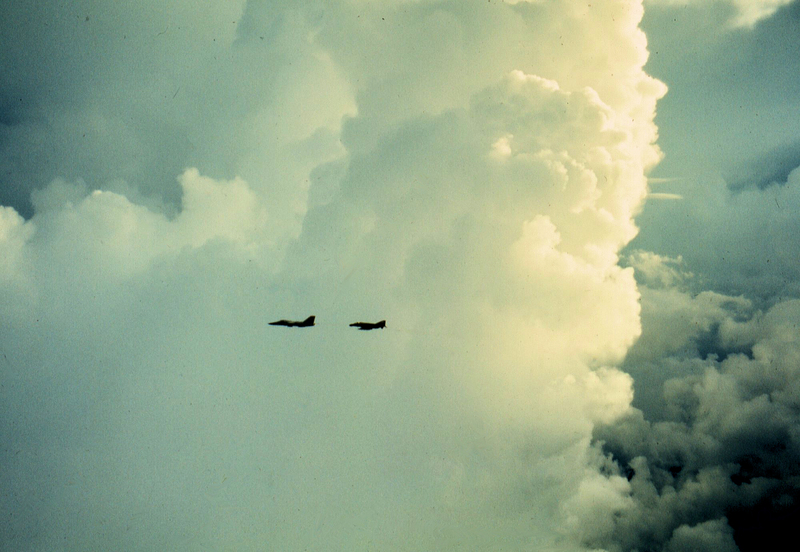 From the standpoint of the ground soldiers, our time in combat was very limited, maybe 5-10 minutes or if you engaged with a MIG fighter maybe longer, although each mission could be as much as 5 hours long. You dropped your bombs and then went home. 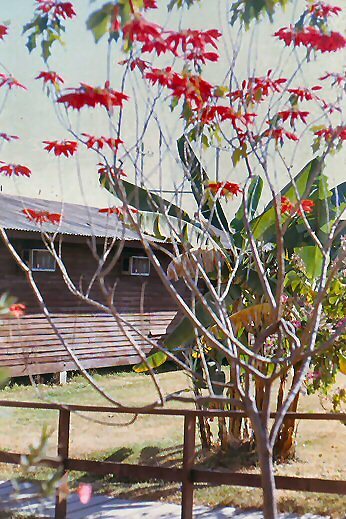 Since we were in Thailand, the Poinsettia Trees on the base were in bloom, another reminder of the holiday, but like shiny tinsel on the tree they only suggested Christmas. The calendar said December 25, but we hardly felt like celebrating. In those pre-email, internet, and cell phone days we really were isolated. On Christmas Day we aimlessly wandered the base. I had it easy, if you contrast it with others in my family. My Dad was in WW II and Korea missing several Christmases. My uncle who died last year spent Christmas 1944 in the Battle of the Bulge. This was a particularly grim episode of the war. The army had expected a quick push and when the advance stalled, the men were ill prepared for the December weather. Though he never, ever talked about his time in combat, he did admit that it was tremendously cold and that there were great losses. I don’t think he even celebrated Christmas. My third great grandfather Lt. Lipscomb Norvell spent Christmas 1780 as a POW of the British. Enough said on that – but he did survive. All these Christmases were terrible. There is no such thing as a good Christmas in war. The men and women who find themselves swept up in war try to cheer themselves up in whatever manner, but it is very, very hard to do. When I say that we restlessly wandered the base on Christmas, it was just that. It was like we were disconnected. We were rootless and we didn’t really understand why. This year many young Americans will again find themselves far from home. They will try to be happy, but the joy will be missing. They will be rootless and not know why, cut off from family and friends and all the things that make Christmas special. Please keep them in mind and think about all that they do for you to keep you safe. Each year I share this story of my good Air Force friend who sent me a Christmas card as a joke and we sent it back and forth until he died in 2015, for 44 years. Since 1971, Santa Claus has come to my house. 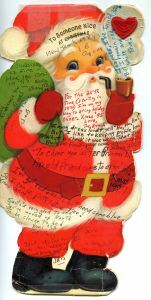 That was the first year that a 12 inch-tall standup Christmas card of Santa, holding a pipe with a heart applique in the billowing smoke, arrived in the mail. It was sent by some close friends that I had worked with as an Air Force lieutenant in Washington, D.C.
For someone who’s been nice all year to take a Christmas Ride. 2014 marked the 50th anniversary of the great 1964 earthquake that hit Anchorage, Alaska. 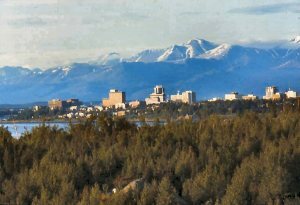 Many folks in Anchorage called it the Good Friday Quake because it hit the city on March 27, 1964. When visitors would come to Anchorage, we always made a point of showing them 4th avenue and Earthquake Park. They were the most visible reminders of the terrible damage that the quake had done to the city. The view of the city from Earthquake Park in 1974, where many homes slipped ino the Cook Inlet. Military men and women often share moments that are seemingly out of time. These are universal events singular to the military experience, but shared across generations. Some of these include: being hunkered down in a fox hole; moving across a battlefield under fire, riding out to the flight line to launch for a combat mission, and experiencing a holiday in a war zone. There is something about being away from home and loved ones at a holiday. It is something that most Americans will never experience and something that a soldier, airman, marine, or sailor often does and will never forget. 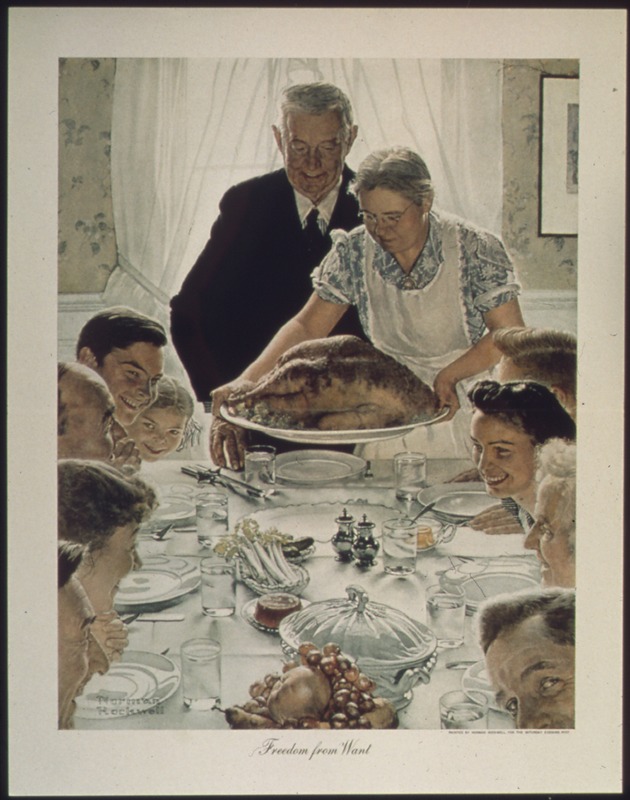 Thanksgiving conjures up to the mind’s eye the 1943 Norman Rockwell painting “Freedom from Want.” It depicts an elderly couple and a happy family gathered around the table, turkey all ready to be carved and eaten, all sharing a sense of safely at home. For the military, Thanksgiving is often just another day. The officers’ club had planned a large feast for the holiday evening meal – a big buffet for $1.00, all you could eat. Yes they charge officers for their meals, there is no free lunch even during war. The club was always noisy, smoky, and crowded. Aircrews were expected to eat at their squadron’s table – camaraderie and all that. 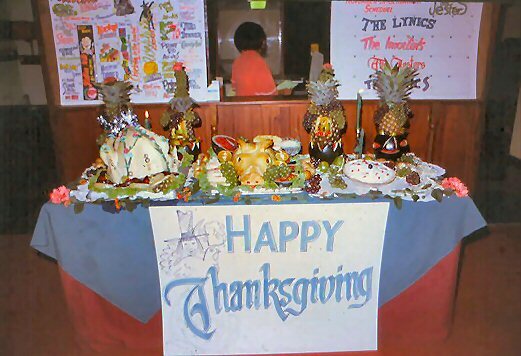 Thanksgiving night Udorn RTAFB Officers Club 1973, lobby display. We decided the night before to have our own private celebration. It was to be our own holiday meal shared with a few close brothers in arms. Perhaps, also, our own attempt for that Norman Rockwell experience. Our small post exchange (BX) had a somewhat limited commissary selection and never had quite the same things twice. For our own holiday feast we chose packaged cheese fondue, which we could heat in a pan on a hot plate. Why the BX had packaged cheese fondue is still a mystery – often things in real life took on a M*A*S*H-like reality. But there was no bread to dip in it. Sometimes the exchange had hot dog rolls, seldom hot dogs though, but the shelves were bare –perhaps others were having their own private celebrations with care packages from home supplemented with the BX’s meager fare. So we scanned the freezer case and found frozen bagels. Overseas one often does the best one can. A year ago I had the honor of being the first speaker at a dinner honoring veterans at our local college. As we approach Veterans Day this coming week, I share my talk again — it is good to remind folks of the sacrifices we made and remember those who mentored us. President Nye, Dr. Pierce, ladies and gentleman and members of the College community, thank you for inviting me to speak tonight. As a former history professor I routinely lectured for 50 minutes so I asked President Nye how long I should talk – He Said SHORTER …. In 1966, I was commissioned a Second Lieutenant. Now admit it some of you may be thinking – , oh great another OLD VET talking about ancient history. And you know what, I probably thought the same thing in 1965 when they trotted out an old veteran to speak to our ROTC class, and I suspect that guy thought the same thing when a veteran from a previous war talked to him.